Film will have three exhibitions at the BAFICI, the Buenos Aires International Independent Film Festival. Selected for the Panorama section, that unites the best of contemporary international cinema, ELENA will have three exhibitions at the 15th edition of the festival, that will happen between the 10th and 21st of April. It is the second time the film is shown with Spanish subtitles – the first was at the Guadalajara International Film Festival, in March. 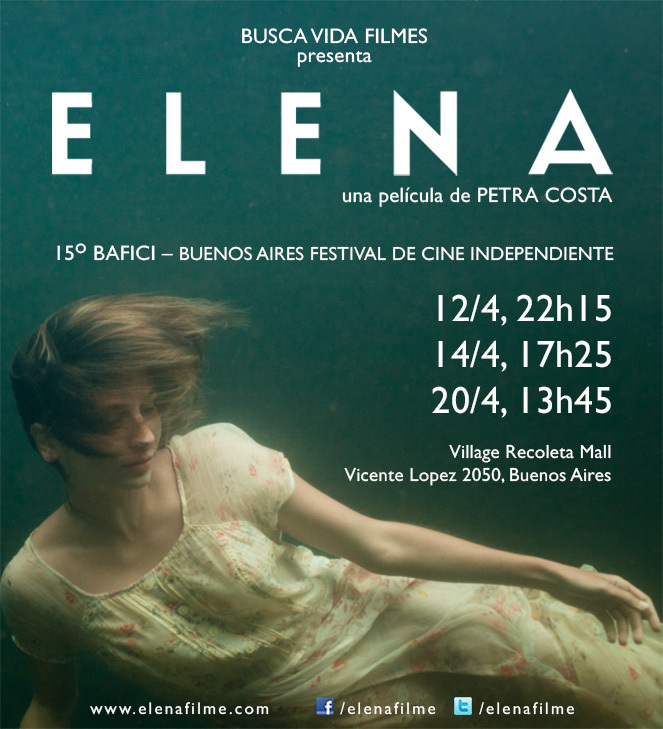 All of ELENA’s exhibitions will be at the Village Recoleta Mall, in different days and times: the 12th at 10.15 p.m.; the 14th at 5.25 p.m. and the 20th at 1.45 p.m.
Other seven Brazilian movies also took part in the the Panorama section of the BAFICI, some of them being “Avanti Popolo” from Michael Wahrmann, “O Som ao Redor ” (Neighbouring Sounds), from Kleber Mendonça Filho, and “Eu Receberia as Piores Notícias dos seus Lindos Lábios” (I’d Receive the Worst News from Your Beautiful Lips), by Beto Brant and Renato Ciasca. The BAFICI, whose acronym means “Buenos Aires International Independent Film Festival”, exists since 1999 and each day more reinforces its importance at the independent scene of the cinema world, specifically in what concerns this cinema’s kind of promotion in Latin America. In the past year, there have been 449 films shown and a record of public: 350 people went to the sessions. The expectation for this year is to receive even more people. We are cheering on that- specially on the days of ELENA’S exhibitions, of course!